So how are my re-pro guitars different than my competitor’s? First off, I don’t just buy finished bodies and necks and throw a quick paint job on them. 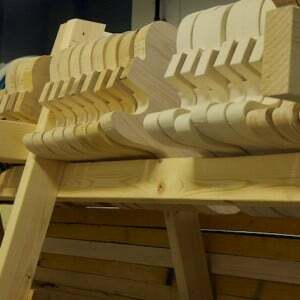 I use methods of construction that are very similar to what was used by Fender® in the ‘50s and ‘60s. My pneumatic pin router is smaller than the industrial models that Fender® used back in the day, but the principal of operation is identical. 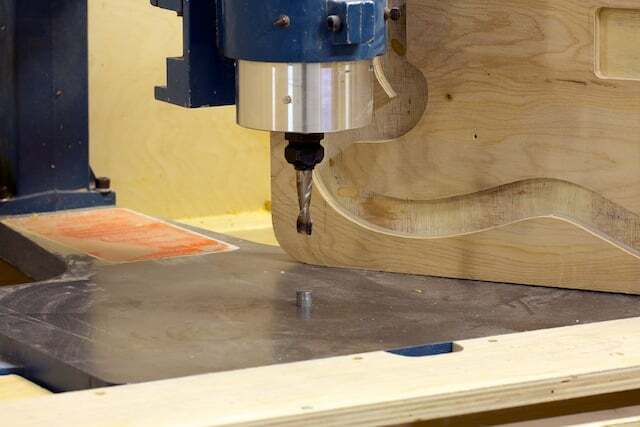 A body blank is attached to a template that rides along a pin in the base of the pin router. 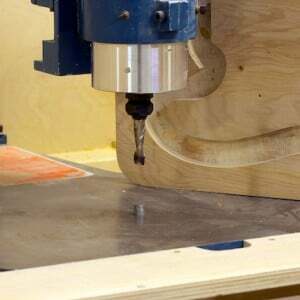 The router is lowered via air pressure and the body blank while attached to the template and sled are moved along the path governed by the pin in the base of the pin router. Here you get a good view of the pin and how it aligns with the same diameter cutter above it. You can also see the bottom side of one of my Stratocaster® templates.